SAN FRANCISCO, CA – August 12, 2014. Joseph & Cohen, Professional Corporation, announced today that Kristina Del Vecchio has been named Chair of the State Bar of California’s Business Law Section’s Consumer Financial Services Committee. Ms. Del Vecchio’s appointment adds to the list of notable positions served by Joseph & Cohen partners in the State Bar of California’s Business Law Section. Founder and Managing Partner, Jonathan Joseph is Chair of the Financial Institutions Committee; and Kenneth Sayre-Peterson, Partner, serves as the Vice-Chairman of Legislation for the Consumer Financial Services Committee. Additionally, Jonathan Cohen, Head of Litigation at Joseph & Cohen, is slated to speak on a panel, moderated by Ms. Del Vecchio, titled New Developments in the Enforcement of Consumer Arbitration Clauses at the annual State Bar meeting on September 14. Published on June 17, 2014, the article explores why more and more bank compliance officers are exploring the scope of insurance coverage under Directors and Officers (D&O) liability insurance policies to address the rise of regulatory penalties against individual bankers. 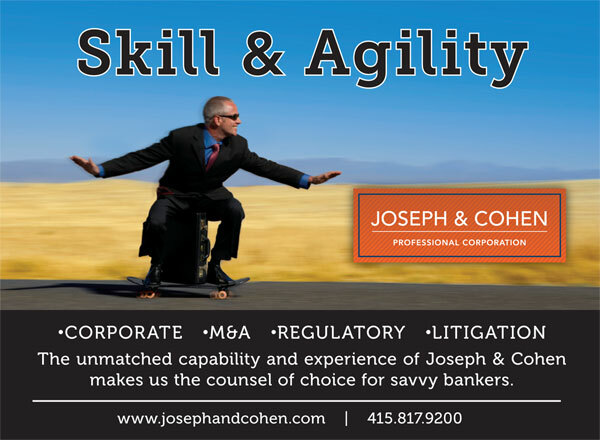 Joseph & Cohen’s core corporate and regulatory practice includes the representation of federally insured depository institutions and the defense of Officers and Directors of financial institutions in civil damage actions instituted by the FDIC or shareholders and administrative proceedings brought by the FDIC for civil money penalties or other sanctions. Joseph & Cohen also has extensive experience in advising institutions and their Offices and Directors in connection with insurance coverage and related litigation. For additional information about Joseph & Cohen, Professional Corporation, please visit our website at www.josephandcohen.com or Facebook at www.facebook.com/josephandcohen.